St John's is a striking mid-Victorian red-brick church designed by architect Samuel Sanders Teulon in 1856. 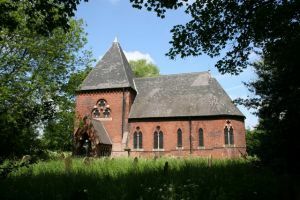 Teulon was a popular Gothic Revival architect renown for his use of polychromatic brick decoration schemes, and the church at Burringham is one of the best surviving examples of his work. Teulon (1812-1873) was a popular architect among members of the aristocracy during the middle of the 19th century and performed work for the Archbishop of Canterbury, the Duke of Bedford, and for Prince Albert, as well as the opulent chapel at Blenheim Palace for the Duke of Marlborough. He also designed quite a number of parish churches, including St John the Baptist at Burringham. He was a close friend of architect Sir George Gilbert Scott. The exterior is very simple, giving no clue as to the richly decorated interior. The material is red brick with limestone ashlar dressing and accents in black brick. The short tower has a stair turret at one angle and incorporates the entrance porch. The nave roof is built to a king-post design with the roof trusses supported on corbel heads. The building stands beside the east bank of the River Trent and is composed of a very short tower integrated into the west end of a short nave, with a rounded apse more usually seen in continental churches. The interior features vividly coloured stained glass and a richly painted ceiling in the sanctuary, showing the heavenly constellations. The interior decoration is polychromatic, mixing red, black, and yellow bricks, with polychrome encaustic tiles for flooring. More encaustic tiled panels decorate the octagonal stone font. The window openings are accented in red and black bricks. The chancel has yellow brick walls with a red diaper pattern, the nave boasts a cross pattern and the tower is decorated with coloured bands of brickwork. The effect is stunning. The organ dates to 1849. It was originally installed at St Andrew's Church in Epworth before it was moved here. The church was declared redundant in 1984. It is no longer used for regular worship and is in the care of the Churches Conservation Trust. It is generally kept locked but there is a keyholder nearby.